Knit sum More: It's a boy! 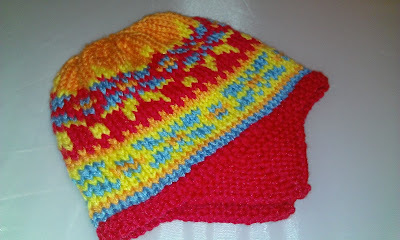 A while back I shared my pattern adapting baby hat with ear flaps. It's been a favourite pattern of mine and all the moms who've received it. So far all the little recipients have been little girls. Well, would you know it a colleague is expecting and she knows it's a boy. How to adapt this wonderful pattern so a little man will be happy to wear it? First things first. Colour makes a huge impact on perception of "girly" factor. The original pattern called for pink, yellow, white, and lilac - all pastels. Just not macho enough. Digging through my wool stash, I came up with some bold bright colours: orange, blue, yellow, and red. The second hurdle to overcome - hearts. No self-respecting little boy would be caught dead in hearts no matter what colour they were. 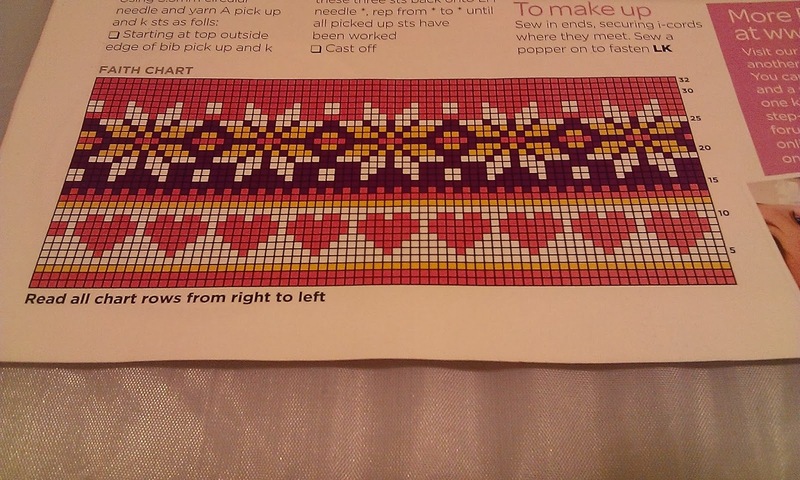 I didn't want to have to work out a replacement pattern as it was only six rows that needed changing. What better way to replace the pattern than using existing elements. I decided to pick out the middle five rows from the snowflake, and work in the additional row in the top band in order to keep the same number of rows before decreasing for the top of the hat. Now there's no way this little chap will be mistaken for a girl!